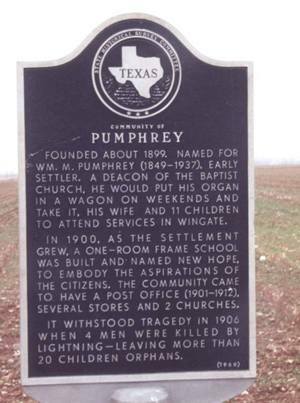 Pumphrey Texas, Pumphrey Texas Travel and History. Originally called New Hope, the town sprang into existance in the 1890s. 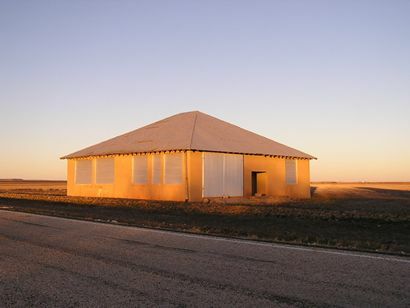 By 1900 the community had a school and the following year a post office was granted. The name New Hope may have been rejected because of previous use, so the name was changed to Pumphrey. No one can now remember if it was to honor W. M. Pumphrey or Lewis Pumphrey, but it must've mattered at the time. At it's economic zenith, Pumphrey had a drugstore, barber, two general stores, and two blacksmiths. The population figures for most of Pumphrey's life are missing, but what is known is that after WWII the decline was underway. In 1950 Pumphrey's last store closed and twenty years later there were just nine diehard residents (who have since moved). 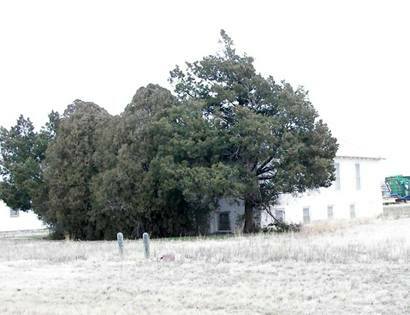 See "Eighteen Ghost Towns of Runnels County" by Alton O'Neil Jr.